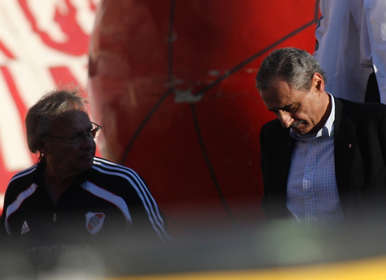 River Plate and Gimnasia y Esgrima La Plata drew 0-0 on Monday to complete the tenth round of the 2010 Torneo Apertura. It was a match that, had River been any good at all, they’d have won easily, but Erik Lamela was bafflingly taken off at half time, the side as a whole lack cohesiveness, and in spite of hitting the woodwork three times in the first half it would be hard to say they really deserved a win. Left back Carlos Arano was replaced with striker Leandro Caruso late on, and surprise surprise, with only two men at the back (right back Paulo Ferrari was as attacking as ever) River nearly lost it on a number of occasions thereafter. You can see the highlights from that game here, along with all the weekend’s goalscorers and red cards. I’ll be putting together a post at some point during the week as a sort of ‘half term report’ on the teams now we’re (just over) midway through the championship. River can’t be dropping points like this at home without ending up with a serious relegation problem, can they?